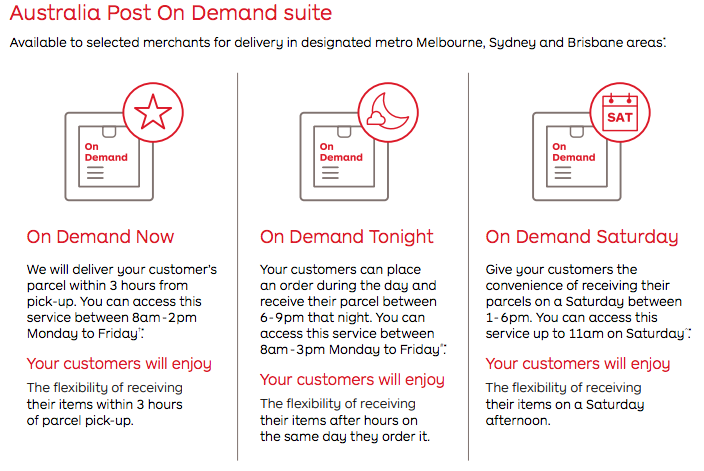 Australia post recently launched their new ‘OnDemand’ carrier services which ReadyToShip integrates with. These new services offer some great courier/same day options to Australia Post/Startrack’s offerings. For retailers that sell product required for events or in faster time frames, the ability to offer a same day or courier service is highly sought after. Here is some more detail about the three services. They are only available in certain metro postcodes, and the same/next day coverage is usually to the same postcode area. For an up to date list of serviced areas, please view the Auspost OnDemand service area list here. NOW: This is a 3 (or 4) Hr courier delivery service, which is a point to point pickup via a Startrack Courier van. 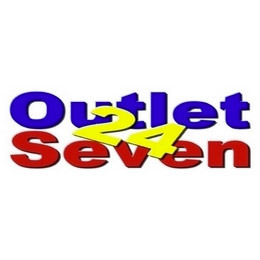 It is direct delivery, from your business to the customer. Manifest must be done as soon as possible, so a job can be allocated by the Startrack courier. TON: This is a great service providing same day delivery to the customer in the evening. Booking again must be manifested before a cut off time for pickup (usually around 3pm). Bookings are picked up by Startrack Courier vans, and delivered to customers between 6 and 9pm that evening. SAT: This is a Saturday afternoon delivery, which can be booked on a Friday or Saturday morning. These bookings can be made on Friday, or Saturday morning up until 11am, for delivery between 1 and 6pm Saturday afternoon. How does the Auspost OnDemand pricing work? The pricing model is quite simple. Each service is a flat fee added to your local Auspost metro delivery rate. This means that each service is the one cost, regardless of delivery postcode. How do you qualify for OnDemand services? Qualification is required, and retailer fit can be examined on a case by case basis. You need to be in the serviceable area, and meet some other general requirements. For more questions, contact your Australia Post account manager. To generate OnDemand labels and update tracking to your customers via your webstore or marketplace you can connect OnDemand to ReadyToShip. Simply sign up for a ReadyToShip account for free here, then follow the prompts to connect to OnDemand services. Ready-To-Ship have nailed it! This program took the stress away and changed our two hour shipping process each day into a thirty minute exercise. Not only does this program automate shipping, but it corrects address data as well. An excellent, easy-to-use system and a great team working there, who certainly give the feeling they want to help grow your business.